Parents and children detained at the US border can be separated and fall into very different legal tracks. McALLEN, Texas — Every night before bed, Wil, who is 6 years old, says his prayers and then kisses two printed-out photos of his mom and dad that are taped on the wall by his bed goodnight. A few hours later, he’s likely to wander out of his bunk bed and stand outside the door of his foster parents’ room, crying and saying his stomach hurts. His foster parents, Coryn and Silas — who asked to be identified only by their first names to protect the privacy of the immigrant children staying in their Michigan home — try their best to comfort him. You’re safe now, they tell him. But Wil’s anxiety remains. US Border Patrol agents separated Wil from his father six months ago, after the pair made the long journey from violence-torn Honduras to the US border in Arizona, attempting to claim asylum there. Within days of arriving in the United States, Wil watched as his father was taken away in handcuffs, joining a long line of other chained men. That, according to his foster parents, was the last time he saw his dad. In the intentionally brutal logic of President Trump’s policy of separating immigrant children from their parents at the US border, Wil is actually among the lucky kids. At least his foster parents know where his father is being held, though not when father and son might be reunited. Three other young children in the care of Coryn and Silas don’t know the location of their parents and have had no contact with them for weeks. The Trump administration’s policy of splitting up families is creating a burgeoning population of dislocated and frightened children, held in makeshift detention centers near the border, including one in a former Walmart, or scattered in shelters and foster homes across the country. As the children and parents experience the fallout of forced separation by US authorities, advocates are struggling to get even basic information about the location and status of these detainees. The Trump administration says the goal is simple: to punish people trying to enter the country illegally, and that means immediately arresting adults and placing them in detention without their children. More than 650 children were separated from their parents at the border in the first two weeks after the policy was officially adopted in early May, according to Senate testimony of Department of Homeland Security officials. A month later, hundreds of children continued to be separated from their parents each week, many of them landing in the roughly 100 shelters and foster homes around the country that were initially set up to house minors who crossed the border alone or in the company of traffickers. Now these facilities are shifting their mission to also handle the influx of children removed from their parents’ custody by the US government. The policy is being applied in such an opaque and ad hoc manner that government case workers, public defenders, federal prosecutors, judges, and the Border Patrol do not have clear answers about if, when, or where children will be reunited with their parents, or even whether separated parents are able to communicate with their kids by phone. Federal Judge Dana Sabraw asked the Justice Department last month whether separated parents “just fall into a black hole” where parents have no way to reunite with their child unless they hire lawyers. Justice Department lawyer Sarah Fabian replied that once a parent is in ICE custody and the child is taken into the Health and Human Services system, the government does not try to reunite them, and instead attempts to place the child with another relative in the United States — if the child has one. HHS spokesman Kenneth Wolfe said the agency doesn’t distinguish between children who were separated at the border and those who showed up on their own. “We find who is in this country that can be a sponsor for that child while providing care to the child in one of our facilities,” he said. The Trump administration alternates between falsely alleging the child separations are happening because of laws passed by Democrats protecting unaccompanied minors, as Trump did in a tweet last week, and celebrating the get-tough tactics. Attorney General Jeff Sessions says he hopes the strategy will deter migrants fleeing Central American violence and chaos — a refugee wave that began nearly a decade ago — from attempting the journey. 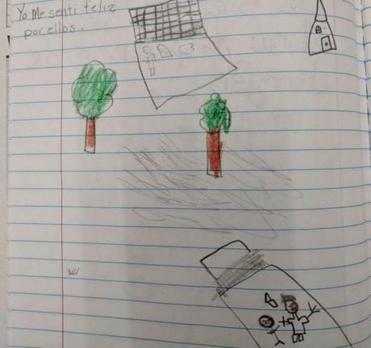 Wil drew this picture of him and his foster father sledding in a park. Once the Border Patrol separated Wil from his father, the government deemed the boy an unaccompanied minor, and funneled him into the system created years ago by HHS to care for the thousands of children who cross the border alone each year. Some unaccompanied minors end up in group shelters near the border, such as the one housed in a former Walmart in Brownsville. Wil was luckier: He was shipped quickly from the crowded Border Patrol facility where he was sleeping on the floor to where Coryn and Silas — an idealistic married couple in their 20s who were inspired by their faith to begin fostering a year ago — picked him up at the airport. He was wearing the standard uniform for unaccompanied minors: black Crocs and a too-big navy sweatshirt, and barely spoke at all. Wil has three young housemates: 8-year-old Karla, 8-year-old Jefferson, and 9-year-old Carrie. They arrived in May, shortly after Sessions made it the government’s official policy to prosecute every adult who crosses the border illegally with a misdemeanor, taking their minor children away from them in the process. All four children were quickly separated from the parent they traveled with to the United States — a drastic departure from how family units were treated in the past, when families were generally released with a court date or held in family detention centers. 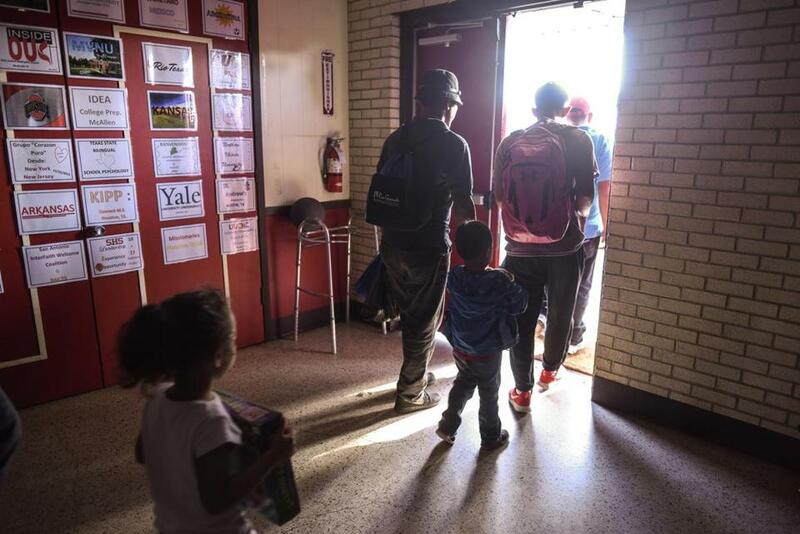 “This is the most aggressive law enforcement approach that I’ve ever seen in 30 years of doing this work,” said Wendy Young, the president of KIND, an organization that provides legal counsel to migrant children. Even some of the nonprofits that contract with HHS to house the children are speaking out in protest. Bethany contracts with the government to provide foster care to unaccompanied immigrant minors, but says many of its foster parents, like Silas and Coryn, are shocked to find out the children in their care were being separated from their parents by the government rather than showing up alone. 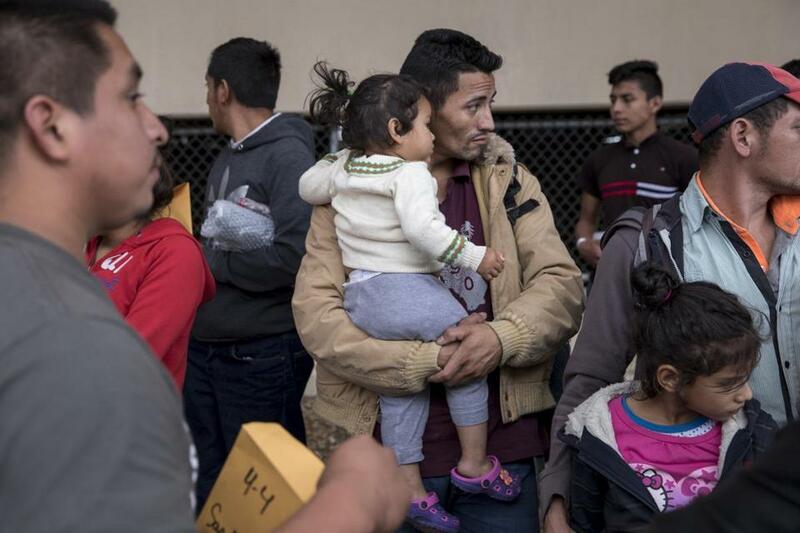 The McAllen, Texas, branch of Catholic Charities is one of several groups that contracts with the government to aid migrant parents and children. The Trump administration’s tactic of using child separations as a deterrent does not appear to be having a major effect on the flow of immigrants to South Texas. Dozens of migrants are still being picked up each day after rafting across the Rio Grande, many with children in tow. On Wednesday, 72 men and women as young as 18 and as old as 56 shuffled into a US district courtroom in McAllen, the clanking sound of their shackled ankles and wrists reverberating in the otherwise hushed room. US Magistrate Judge Peter Ormsby explained to the group that they had each been charged with a federal misdemeanor for coming across the Rio Grande and into the United States illegally. They would each have a chance to plead guilty or not guilty to that charge. One by one, every defendant pleaded guilty. The vast majority of them were sentenced to time served by Ormsby, which meant the few days they had been in Border Patrol custody would be all the punishment they received for the crime of crossing the border illegally. After, many would be transferred to ICE detention to await trial in the immigration court system. Others could be deported immediately. But for the thirteen people in the group who had traveled with children over the border, their punishment had just begun. Azalea Aleman-Bendiks, a federal public defender in McAllen representing the migrants in the mass court proceedings, asked those who had been separated from their children already to stand up. The exhausted-looking group included Freddy Diaz Paz from Honduras, who had been separated from his 9-year-old son, and Elizabeth Vasquez Lopez from Guatemala, who was separated from her 8-year-daughter. One woman stood in gray socks and ballet flats, her shackles visible right above them. Ormsby said he didn’t believe their children were within his court’s jurisdiction, but he would consider the argument if she wrote a brief about it. The judge said he hoped the parents would be reunited with their children soon, and urged the government to ensure the parents have access to phones to call HHS and can find out where their kids are. He then turned to the defendants. “I hope you understand the reason there was a separation is you violated the laws here,” Ormsby said to them. 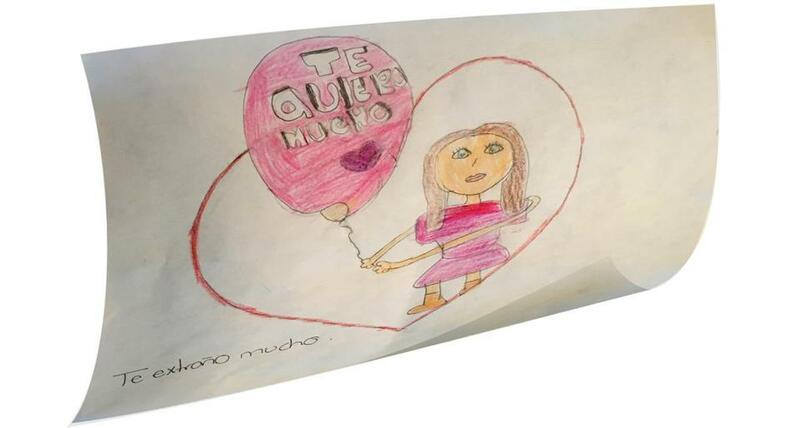 A 9-year-old who lives with foster parents in Michigan drew this for her mother, who was detained by ICE. The Trump administration says parents are separated from their children because of their misdemeanor offense of crossing into the border illegally, which requires them to be taken into federal custody where children cannot join them. But once parents have served their time for that minor federal offense, they still can face months in ICE detention, often with no idea where their children are. Aleman-Bendiks, the public defender, said several of her clients have told her their children were taken from them by Border Patrol agents who said they were going to give them a bath. As the hours passed, it dawned on the mothers the kids were not coming back. In late May, separated parents in McAllen were given a number to call HHS and try to locate their children. It was the wrong number. Last week, parents were given a handwritten note telling them to call ICE — not HHS — if they wanted information about how to reunite with their children. But parents did not have access to phones at the time, rendering the number useless. Children face even more challenges in finding their parents. Many of the youngest ones aren’t even verbal, leaving case managers to try to put together the pieces. Only one of the four children in Michigan, Wil, has been able to speak with his parent since they were separated. He talks to his father on the phone about once a week, excitedly answering the call from the ICE prison in Arizona where his father is being held awaiting a hearing on his asylum claim. The two also write letters, with the help of Wil’s case manager from Bethany. Wil often holds up a drawing of a heart that his father mailed him to the window, tracing it on his own piece of paper over and over again, his foster father, Silas, said. He sent his dad a picture of him in his soccer uniform in Michigan. But in the 2½ weeks since they arrived, Bethany’s case workers haven’t yet been able to track down Karla’s mom, Jefferson’s mom, or Carrie’s mom in ICE detention. The kids ask often when they’ll get to see their mothers again, and Silas and Coryn tell them they don’t know yet, but that people are working hard to try to make it happen. The scenario raises all kinds of questions for the children, who are now pursuing their own legal cases to try to stay in the United States — a goal that only a small fraction of unaccompanied minors achieve. The separations have also made it harder for the government to connect children with relatives in the United States. HHS case officers attempt to locate a close blood relative as quickly as possible to transfer unaccompanied children to their care. That sponsor is then responsible for taking children to their immigration court dates. But many of the closest relatives for this new wave of children are in ICE detention, and unreachable. Karla, the 8-year-old in Silas and Coryn’s care who has not yet been able to talk to her mother, showed her foster parents a man’s belt with her uncle’s name and a number written on the back. Coryn said she felt like she had found “treasure” — a link to a potential sponsor for Karla. But when they called the number, it was disconnected. If the children’s parents lose their bids to stay in the United States and are deported, it may take weeks or even months for their children to follow them, since they are on separate legal tracks, according to immigration experts. ICE said it wants to connect families so they can be shipped back to their native countries together, if possible. Authorities “will work together to locate separated children, verify the parent/child relationship, and set up regular communication and (deportation) coordination, if necessary,’’ said an ICE spokeswoman who did not want to be identified, in an e-mailed statement. Silas said he overheard the four children in his custody last weekend sitting in the living room and talking among themselves rapidly in Spanish about what it was like when they were separated from their parents. Jefferson told his foster siblings that his mom cried and yelled when they were separated. Wil shared the story of seeing his dad led away in chains.